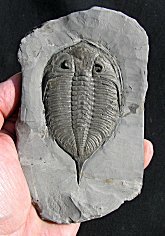 Size: Trilobite is 3.5 inches long! 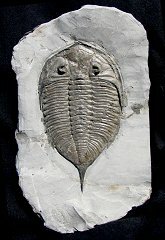 This is a GIANT example of a classic US trilobite. It is a HUGE Dalmanites limulurus from the Silurian of New York. The freakishly-large trilobite is almost perfectly prone and very nicely articulated. The bug is well inflated and exhibits fine detail. The compound eyes protrude well above the sleek carapace of the trilobite. The broad genal spines and the pointed caudal spine are clearly defined. The fossil has excellent color and contrast and is well showcased on the large plate of shale. And...it is just gigantic for this type - THREE AND A HALF INCHES LONG! Our crew dug this site for many years and this is the largest one we ever saw! This is an extremely collectible, MONSTER example of this classic trilobite from the Rochester Shale.